Every food and beverage facility is concerned about sanitation, safety and durability. Our flooring systems are designed to meet the stringent requirements of the food and beverage industry. With our extensive experience in the Food and Beverage Industry, we understand the day-to-day sanitation needs your processing plant demands. Dudick, Inc. has developed products which are FDA and USDA compliant, slip resistant, and low odor. 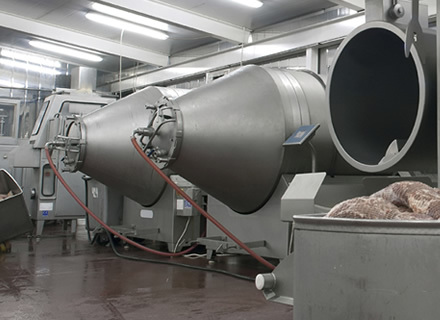 Our floor and walls systems are designed to meet the sanitation requirements in bakeries, dairies, breweries, meat packaging plants, food manufacturing plants and commercial kitchens. Food and beverage processing plants and commercial kitchens pose one of the harshest environments for floors to survive in. Flooring systems must resist not only bacterial growth, but also corrosion caused by fats, acids and other by-products. We specialize in floors that are thermal shock resistant, chemical resistant, and sanitary. Application over damp concrete is no problem. Your processing floor contributes to the overall sanitation of the facility which makes repair projects mission critical. Our Field Technicians can help facilitate the installation of new floors or the restoration of existing floors. With little or no down time, damaged floors can be restored to create an environment that meets the stringent requirements of the food and beverage industry. New floors can be installed in a weekend. We have the skill level and experience to perform any type of USDA compliant food and beverage flooring system installation from consultation to execution.